Photo by Ivan Seryodkin, WCS. 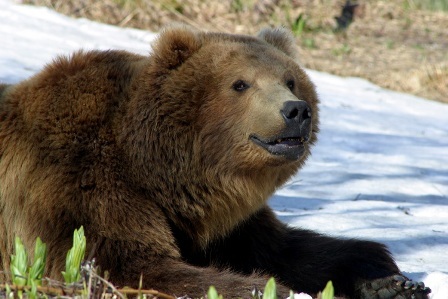 WCS, in collaboration with a number of Russian organizations, has been involved in brown bear research in the Russian Far East for nearly 20 years. We work with the Sikhote-Alin Zapovednik in Primorye, with the Kamchatka Hunting Department in Kamchatka, and the Pacific Institute of Geography (Russian Academy of Sciences) and Sakhalin Environment Watch on Sakhalin Island. Our current research is focused on this latter site. Our Sakhalin Island project, ongoing since 2009, has sought to study the ecology of brown bears on Sakhalin Island in order to develop conservation and management recommendations for the species.We have used a variety of monitoring techniques to work towards this goal,including capture and GPS tracking, camera trapping, visual observation, and sign interpretation. This is a wide-ranging, ambitious project, which includes multiple components including investigations of bear home habitat use, nutrition, scent-marking activities, interactions with primary prey (salmon), parasitic diseases, and human-bear conflicts. 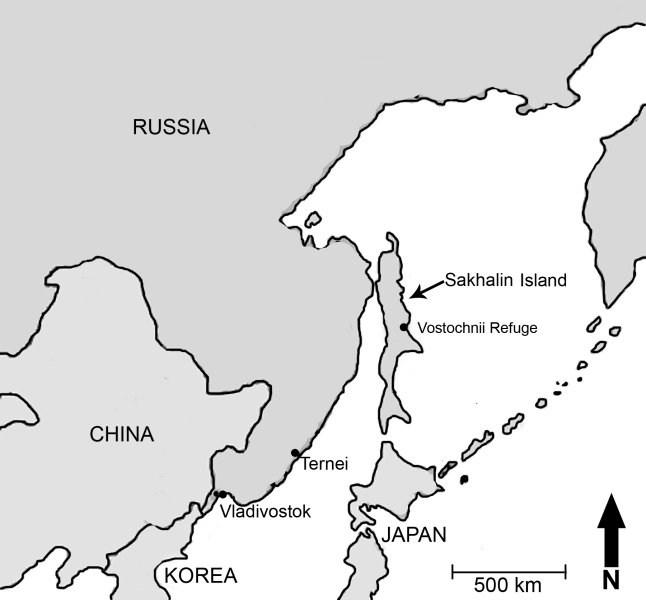 Map of Vostochii Refuge, the location of our Sakhalin Island bear research. Since 2002 WCS has used bears as a lens to focus attention on the most critical aspects of biodiversity conservation on Kamchatka. By using GPS collars to study a number of aspects of brown bear ecology, WCS has obtained the best data ever collected on brown bears not only in Kamchatka, but in all of Russia. Data from our first two GPS collars were groundbreaking, showing that, for example, brown bears maintain home ranges 10 times larger than previously estimated by local biologists. This kind of information is critical to addressing conservation and management questions more effectively. In collaboration with Alaska Fish and Wildlife, WCS also is collecting tooth, hair, and tissue samples from trophy bears killed on Kamchatka. We use teeth to estimate the ages of the harvested bears, which will allow us to determine whether the average age has decreased because of extensive hunting pressure targeted at older, larger animals. Genetic analysis of tissue samples, in turn, will help to determine if there is adequate gene flow among the bears of the peninsula. In cooperation with the Kamchatka Hunting Department, WCS has instituted protocols to collect and monitor data on bear-human conflicts, poaching activity and trophy hunting. The hope is that by reviewing historical data and trends, together we will be better able to direct future management and conservation actions. WCS has also conducted the first ever mark-recapture population estimate in Russia, with an aim to provide different scientifically rigorous methods of censusing bears. Other research on general bear ecology includes monitoring salmon consumption rates, vegetation forage, denning characteristics, as well as the social dynamics of bears around salmon streams. The people of Kamchatka have very little access to good ecological information about the bears that are so abundant on the peninsula they call home. Many Kamchatkans, even trained biologists and wildlife mangers, exhibit a strong fear and apathy towards bears. WCS has identified lack of information and misinformation about bears as a potential conservation threat, and is working to address this issue. Our brown bear education program has been distributed to school boards throughout the peninsula in the form of “bear education kits,” and has been recognized as a potential source of guidance and materials for the Kamchatka Department of Education’s ongoing development of primary school ecology curricula. In 2006 WCS hosted a meeting of hunting managers, Russian and international bear biologists and NGOs, which led to the development of a cooperative working group to address all aspects of the brown bear’s future in Kamchatka. Interagency working groups are almost unheard of in Russia. Using models based on the collaborative management of grizzly bears in Yellowstone and Canada, WCS in association with WWF Kamchatka is directing the Brown Bear Working Group to develop concrete strategies for bear conservation in the future. Meetings are held regularly, with representation from all branches of government (including the governor) and industry. This group represents one of brightest hopes for making effective changes for bear conservation in Kamchatka, as well as providing a model for the rest of Russia.